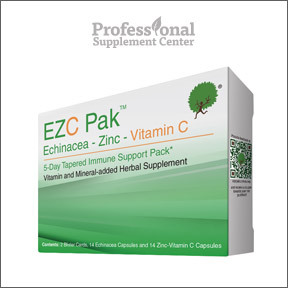 Professional Supplement Center now carries EZC Pak™, a physician formulated nutritional support pack intended to provide the core components for appropriate immune support while reducing unnecessary antibiotic usage. Concern over the rise of antibiotic-resistant superbugs led physician and Medical Director Sarath Malepati to tackle the fundamental problem of inappropriate antibiotic over-prescribing for common viral infections. Misuse of antibiotics can have harmful consequences for both the patient and for global public health, as many scientists and health professionals are concerned about the rise of superbugs and antibiotic resistance. Dr. Malepati developed EZC Pak to assist a “wait and watch” approach and relieve the pressure to prescribe unnecessary antibiotics. He believes that, “While there is certainly a time and place for antibiotics, usage should be limited to the right medicine at the right time.” EZC Pak™ is a vitamin, mineral and herbal OTC formulation based on the best available evidence of the active core components and the U.S. Recommended Dietary Allowance (RDA) guidelines. Only high quality ingredients, including certified organic echinacea, zinc and vitamin C, are utilized in this well tolerated, appropriately formulated immune support pak. Vitamin C – Water soluble vitamin C supports many metabolic functions and is found in high concentrations in the immune cells. Vitamin C is believed to promote the immune response by supporting the immune cells that are involved in fighting viral and bacterial infections. Regular intake of vitamin C has been shown to reduce both the incidence and the duration of illness. Zinc – Zinc supports the immune system and a wide range of critical functions. When initiated within 24 hours of the onset of illness, zinc has been shown to reduce the duration and severity of illness symptoms. General recommended use of moderately higher doses of zinc is 5 days. Proprietary Echinacea blend – Long used in traditional medicine, echinacea is believed to aid the immune system’s ability to help clear viral infections by promoting immune T-cell activity. Echinacea is intended to be used at the first signs of illness, generally within 48 hours of onset, and continued for 5-7 days.